Alana Thompson, aka Honey Boo Boo, was taken back to her glamorous contest days in Wednesday’s episode of Here Comes Honey Boo Boo. Honey Boo Boo was clearly enjoying herself as she tried on garish and colorful gowns for her forthcoming role as flower girl at her mother June Shannon’s commitment ceremony to father Sugar Bear. 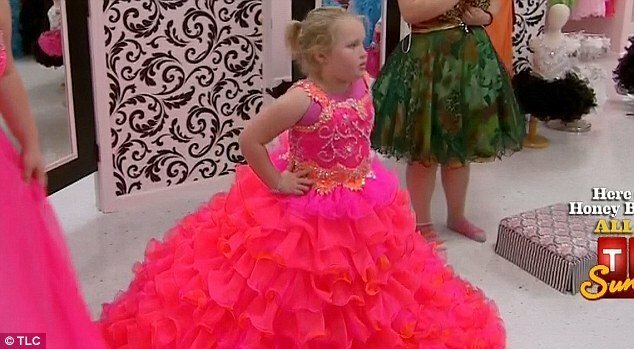 “To be honest, I look good in all dresses,” Honey Boo Boo told viewers after trying on a bright fuchsia pink dress complete with frilled skirt. Alana Thompson appeared to enjoy the expedition a lot more than her older sisters, with Lauryn “Pumpkin” and Jessica “Chubbs” not used to wearing dresses. Older sister Anna “Chickadee” faired a little better due to her being “really skinny” according to Pumpkin. However, there was an equal amount of discussion about the smell of Pumpkin’s feet than the dresses themselves. An ultra short minidress was dismissed by June Shannon as “not age appropriate”, before she settled for a pink and blue number. The sisters were busying themselves in preparations for the forthcoming commitment ceremony and to take their mind of family patriarch Sugar Bear’s mystery illness. Sugar Bear, real name Mike Thompson, remained in hospital recovering while the girls stayed in charge of cleaning the house and arranging a bridal shower for Mama June. Of course, the food list for the big event ended up taking priority, with meatballs, steak and a buffet all being thrown forward as possible options, before the girls settled on a pizza and chicken wings for the bash. “We hope this bridal shower will hope Mama calm down, because she needs a little celebration or something,” Chubbs told viewers. The big day came with June Shannon accosted by her sister’s new boyfriend Jose who found himself the only man in the restaurant as June and her friends chowed down on food and drink. However, Pumpkin ruined the sisters’ unusually ladylike behavior by squashing a slice of tiramisu in her mother’s face, which June Shannon objected to, mainly because she is not a fan of the Italian desert. Mama June then got emotional when it came to thanking her friends and family for attending and said she hoped they’d all be at the commitment ceremony. Earlier, the four girls had been left in charge of keeping house while Mama June was visiting her partner in the hospital. Honey Boo Boo appeared to have a very novel way of keeping the house clean, using the same mop for the floor as the inside of the fridge and the cupboard doors. “It is very emotional – for me and the kids,” June Shannon said. Honey Boo Boo was thrilled to be reunited with her father when he was finally allowed home and the pair shared a welcome home thumb wrestle.